NEW YORK • Nike has vowed to fix issues with its National Basketball Association (NBA) jerseys after a string of high-profile incidents which have seen shirts torn to shreds. The opening weeks of the NBA campaign have seen multiple incidents of torn jerseys, creating a public relations headache for Nike in the first season of an eight-year deal as the league's jersey supplier. Several of the league's biggest names, including LeBron James and Draymond Green, have been seen wearing tattered shirts since the season began. Last week, Sixers star Ben Simmons' shirt was almost completely torn apart as he tussled for the ball during his team's game with the Indiana Pacers. "Nike always puts the athlete at the centre of everything we do and we have worked hard to create the most advanced uniforms in the history of the NBA," the company said in a statement on Tuesday. "They are lighter and deliver great mobility and sweat-wicking characteristics, and the feedback from players has been overwhelmingly positive. However, during game play, we have seen a small number of athletes experience significant jersey tears. Tyler Ennis' jersey number. 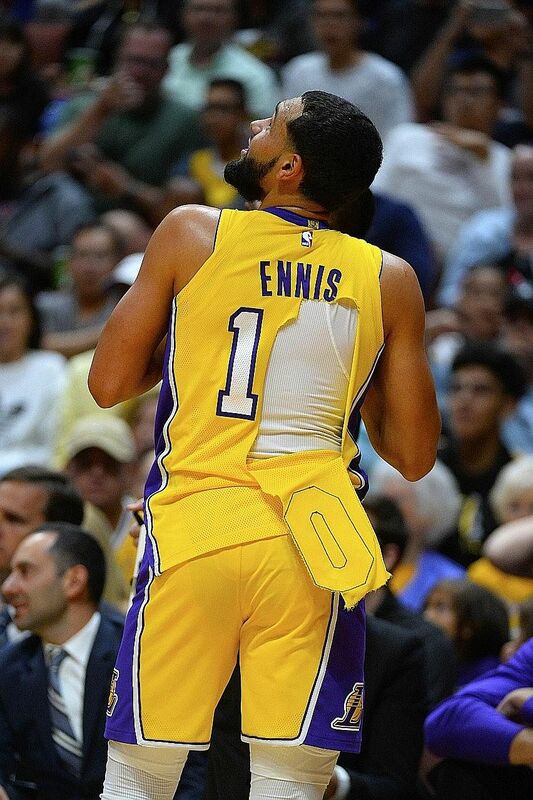 The Los Angeles Lakers guard had his jersey ripped up by Aaron Brooks, who grabbed it to prevent Ennis from getting away on a fast break during an exhibition game between the Lakers and the Minnesota Timberwolves in September. Ennis tossed the jersey to a lucky fan as a souvenir. "We are very concerned to see any game-day tear and are working quickly to implement a solution involving standardising the embellishment process and enhancing the seam strength of game-day jerseys. "The quality and performance of our products are of utmost importance and we are working with the NBA and teams to avoid this happening in the future."